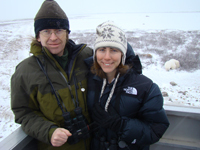 In November 2007, Kassie Siegel and Brendan Cummings – respectively the Center’s Climate and Oceans program directors, collaborators on the scientific petition to list the polar bear under the Endangered Species Act, and real-life partners to boot – departed their home in the desert outside Joshua Tree for a trip north to Churchill, Manitoba, Canada. 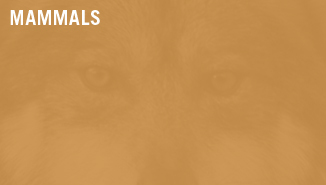 Their mission: to help a Canadian film crew shooting a documentary on the polar bear’s plight. And to experience, for the first time, the awe-inspiring animals to which they’ve devoted so many long days and late nights – polar bears, in the wild. Here’s an account of that trip, in their words and photos. Flying north from Winnipeg, Canada, the grid of urban and agricultural development gradually gives way to the natural undulations of land and drainages and then to the many lakes dotting Manitoba. Then we hit cloud cover, and the view is blocked for now. On Friday afternoon I spoke at a law conference on the Endangered Species Act at the Fairmont hotel in San Francisco. As usual, I spent most of the time showing polar bear photos and talking about the species’ natural history, its dependence on Arctic sea ice, and the rapid meltdown of its sea-ice habitat due to global warming. Like most people in the audience, I've never seen a polar bear in the wild, but one doesn't need to have seen them to be affected by their plight. Just over 24 hours later Brendan and I are on a 36-passenger propeller plane heading due north to Churchill, Manitoba, Canada, on our way to see polar bears in their natural habitat for the first time. The Canadian Broadcasting Corporation is making a documentary on polar bears that will touch on the Endangered Species Act listing process, and Brendan and I have been invited to Churchill to join the crew for two days of filming polar bears from a "tundra buggy" near Wapusk National Park. We didn't wait to be asked twice. I’m profoundly grateful for this opportunity, but my excitement is also bittersweet. 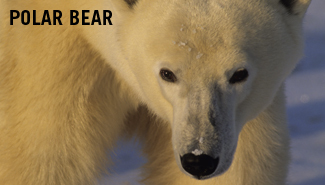 The Western Hudson Bay polar bear population is now critically endangered by global warming. I’m filled with anticipation, but also wonder what we will find. I wonder how the bears will be faring this year, after their summer of fasting on land – a summer which is slowly but inexorably lengthening as the planet warms. At the Churchill airport we are met by Robert Buchanan, President of Polar Bears International and a 20-plus-year veteran of the Churchill polar bear scene. Robert was instrumental in making this trip possible for us, finding us a place to sleep at the last minute and adopting us into the extended family for the duration. We drop our bags and enjoy the lunch special at Gypsy's, the local bakery and restaurant packed with tourists at the height of the season. Robert takes us on a tour of town and immediate environs, and we see our first cross fox, a color variant of the red fox (Vulpes vulpes). The fox is gorgeous. It kills something – presumably a lemming – and gulps it while we watch. Brendan IDs a distant speck on the horizon as a common eider. I’ve seen many, many wonderful photos of this area, and yet I’m still blown away by the beauty of the tundra and Western Hudson Bay. On the way back into town Robert stops to speak with another film crew from Japan. We learn afterwards that the young woman Robert greets is Konishi Manami, a sensationally successful actress known as the “Britney Spears of Japan," in town to film a special on polar bears and climate change. She is mesmerizing. After a lovely dinner with the Polar Bears International crew, we send off this first entry and head to bed. We will be heading out at first light in the tundra buggy towards the n national park and the first wild polar bears of our lives. Our day starts at 5:00 am, so we can be out on the coastline by sunrise. There’s already action out on the tundra, and this morning we spot our first cubs. There are several families in the vicinity, two mothers with two cubs each, and one mother with a single cub. We observe and photograph one of the mothers with two cubs on and off for most of the morning. She is closely shadowed by a solitary male, and several times we see her charge him to get him to back away from the cubs. The cubs we photograph are almost unbearably cute, but they are also far smaller than they should be: they are 10 months of age but look as if they are half that. Even with the devastating knowledge I have of the situation facing this population, it’s impossible not to also feel joy watching them. The afternoon's magic begins with Brendan spotting my first Arctic fox. She seems to be on a scent, moving quite quickly from one spot to the next, sticking around long enough to allow us a very good look but not all that good a photo. As sometimes happens, one first encounter leads to another, and after we leave the Arctic fox, Brendan spots a snowy owl on a gravel spit. While watching the owl, we see a polar bear swimming in the water. The bear makes a beeline for shore, emerging from the water and treating us to a memorable shake of the water from its fur. It then begins moving across the gravel bar towards the snowy owl, which we expect to flush. The owl, though, is completely unperturbed, and we get to watch the bear slowly approaching us with the owl in the background. The bear then begins to roll in the snow, a common behavior after swimming which removes water from the fur, and also provides us with quite a show. The mood of the moment comes through in these photos. Despite having started the day at 5:00 am, it seems as if no time at all has passed before the sun is sinking rapidly towards the horizon. 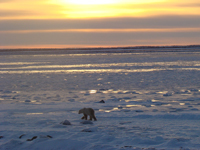 Through a brief but spectacular sunset we remain riveted, as bears become visible all long the coastal flats, silhouetted against the sky and water. With a sense of near unreality, we watch a bear walking into the sunset. The beauty of the moment is hard to describe. The time with the bears has passed all too quickly, but we are completely filled with the wonder and beauty of these animals and this place. And the day is far from over. We head back into town for dinner, and then a lecture on polar bear ecology and conservation by Dr. Andrew Derocher organized by Polar Bears International. Dr. Derocher is a fantastic science communicator, and despite having read a good percentage of the papers he's published, I still learn a huge amount. It's been over 20 years since anyone was killed by a polar bear in Churchill, but still, there's a certain edge to the walk home after the evening's lecture. Snow-covered rocks look an awful lot like bears after a full day of watching the mighty beasts out on the tundra. We do make it home without incident, however, and settle in for the evening. It has been another day to remember for the rest of our lives.